Enjoyng the 1st year of success from helping create iAdvocate, Advanced Authoring begins working on its second venture with Syracuse University. 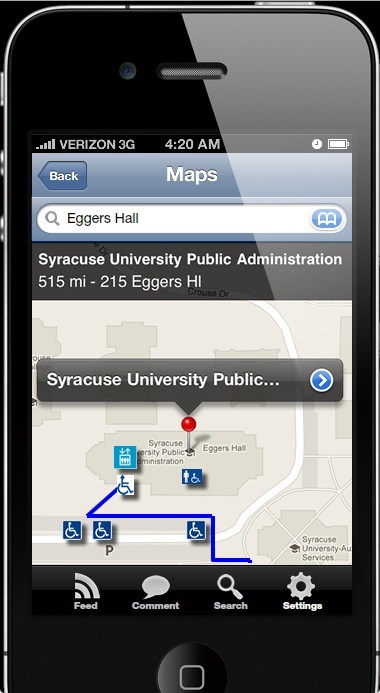 AccessSU will be a mobile website designed to provide accessible resources and information available on and around the Syracuse campus for individuals with disabilities. Among the resources, a map showing accessible areas of campus such as parking, restrooms, elevators and building access ramps. Plans are also being laid to provide direct routes, and allow the Syracuse community to share comments and tips to help others. This entry was posted in crowd-sourcing, Interactive, iPhone, Maps, mobile, website by Britt Carr. Bookmark the permalink.